Hi y’all! Okay so in my previous post a while back I talk about how I switched my nails up to a flat black (matte) color instead of the traditional shiny top coat. First there was the French manicure phase, then crackle nails, and now matte nails seem to be the trend. 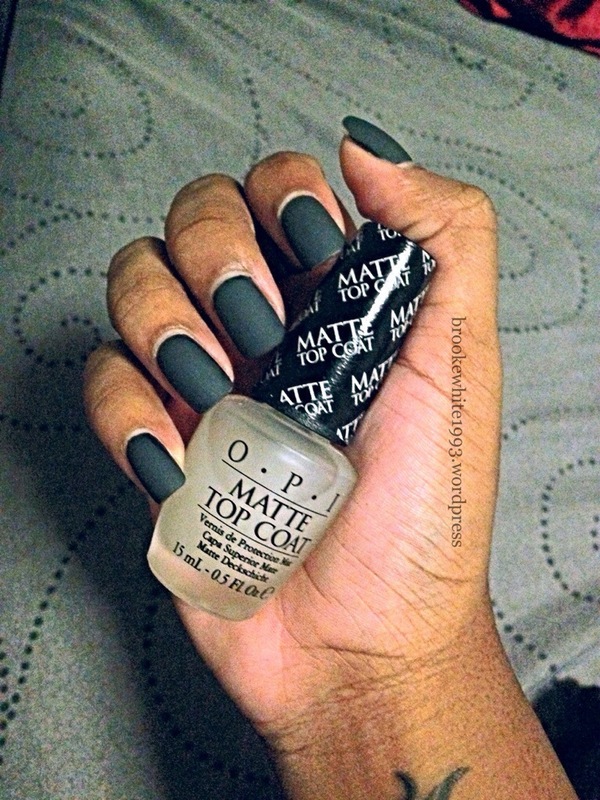 Even though I get my nails professionally done biweekly, I decided to buy matte top coat on my own (the actual polish itself is not matte, it’s the top coat that makes it matte) since my local nail salon did not carry it. I went to my local Ulta store & there were so many brands to choose from. I finally ended up deciding on the OPI Matte Top Coat, a brand I was familiar with. After getting my nails done, I gave the top coat to my nail lady to put on. The results were gorgeous!!! Well, the excitement lasted about 2-3 days because immediately from my normal routine of just touching things, the matte became less flat & started to become almost shiny again. It definitely was no longer dull like the way it was when I got it done. Then I began to notice fine white scratch lines on my nail, from just daily bumping against my nail. It looked very noticeable and not cute! Ugh! I was extremely frustrated!! Honestly, in my opinion I don’t think matte is all that worth it, especially if you don’t regularly get your nails done & you decide to splurge & treat yourself …you might be disappointed. Instead of getting matte done at the salon, I wear them shiny for a week, & then matte the week I get them done. Makes a nice variety. I plan on getting my nails done again this upcoming weekend so since this is week 2 I went ahead & put on the matte top coat again. I already notice 1 small white line on my thumb! This is just my experience with OPI’s brand ($10), so you may have different results; just wanted to give you girls a heads up! Especially since I wouldn’t want you to waste money if you’re on the fence about it. I wonder if the more expensive brands will have a different result. I know Chanel makes a matte top coat, but it’s so hard to find. It’s sold out everywhere, in fact, it may be discontinued. I’ll look around for you guys & if I find it, I’ll share my experience with you. …at least on the OPI brand.